Fun Halloween treat to make this season, easy yummy and cute- perfect for making with little ones! – In a sauce pan, empty your 2 cups of marshmallows and turn onto a medium heat. Stir continuously as the marshmallows beginning to melt down and become a sticky goo- once the marshmallow mixture is completely smooth turn off the heat. -Fill a clean saucepan with boiling water, put on a low heat and place a bowl over the top of the sauce pan to create a double boiler in order to melt the white chocolate. Break the white chocolate into small pieces and place in the bowl over the saucepan allowing the chocolate to melt. – Add the melted white chocolate to the melted marshmallow saucepan and stir vigorously until the mixture is completely combined. -Begin adding the rice krispies a cup at as time and stir into the white chocolate marshmallow mixture ensuring all the kipsies are coated. -Take a heaping table spoon of mixture and roll into a ball placing it on a grease proof paper lined plate, continue this until all the mixture has been used. -Place two shelled pumpkin seeds in the top of the rice krispie balls to imitate ears and a goji berry in the centre to make a nose. 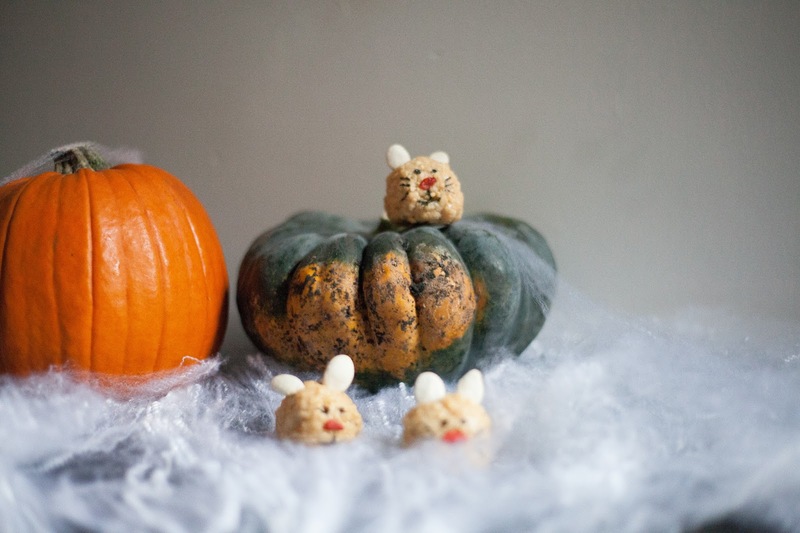 -Allow the treats to set in the fridge for up to an hour before removing and using the cake decorating pen adding eyes, mouth and whiskers to complete your Halloween mouse! -Keep in the fridge until serving and enjoy!